Fiber Optic Keystone Tiles can provide lighting to almost any area of a home. Approval of applications for U.S. patents usually does not come either quickly or easily, but that was not the case for one local inventor. Hugh Cobb III, who along with his wife Joyce owns and operates Cobb Home Innovations, a Woodbury-based electronics, home theatre and speciality lighting business, received word this month that his request for a patent has been approved. On average, only about 40 percent of applications are approved by the U.S. Patent and Trademark Office, and sometimes the process can take years. In Cobb's case, his patent for "illuminated tile assembly" was granted after only about eight months of review. "We were expecting to have to battle for this for years," Cobb said. "It's kind of unheard of to have it go through the first time." Cobb uses his invention in the process of manufacturing Fiber Optic Keystone Tiles, which are used to provide decorative lighting in places where high voltage lighting is not permitted. Fiber Optic Keystone Tiles are decorative accent tile boxes that mimic real stones, or tiles when not illuminated, but when lit, provides ambient lighting without the use of a standard bulb. These innovative tiles can be used in wet areas, such as the bathroom, the kitchen, or by the pool, where high voltage lighting cannot be used due to building code restrictions. The tiles can be programmed to change colors and are maintenance free. Cobb says that many areas in or around a home would benefit from decorative lighting systems. Currently, homeowners are forced to install the standard, recessed, water resistant lights in the bath and shower areas, he says. These light systems are lacking variety. The walls in the kitchen are also not ideal places for decorative lighting due to the strict high voltage restrictions in place. The bath and kitchen, as well as the patio and pool areas, are places that often get wet. Many light systems are unable to be exposed to water, and therefore these areas of the home have limited options. According to Cobb, Fiber Optic Keystone Tiles provide homeowners with an attractive option for lighting different areas of the home. 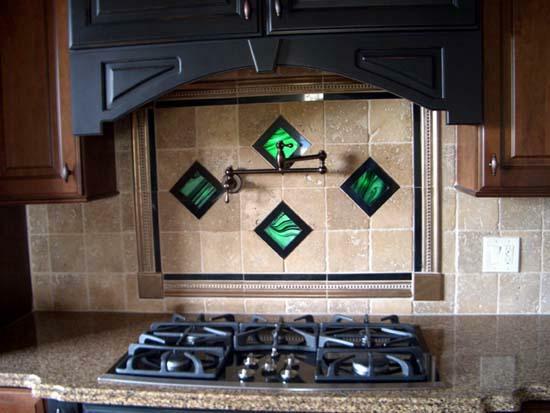 The decorative accent tile boxes mimic natural stone or tile when not lit. A glow fiber optic cable provides an ambient source of light. The keystones are approximately 2" by 4" of square, plastic housing. There is also an approximate 6" tile frame, which the keystone is adhered to. This frame may be available in many different stone designs and unlimited variations of tiles to accommodate user preferences. Tempered glass, approximately 1/4" thick, and approximately 1/8" decorative glass of choice can be laminated flush into the housing keystone. The glass may be available in different colors to provide more options for the homeowner. This may be assembled as one unit to simplify the installation process. A 12 or 25 strand fiber optic cable may be inserted into the connector contained in the lighted box. Fiber optic is illuminated by an illuminator box, which has one bulb that can feed multiple keystones. The system may be programmed to change colors, or locked into one desired color. The exact design and measurements may be determined by manufacturer. The Cobbs say that now that the patent for the invention has been approved, they must now decide on one of two options they have in determining how to proceed with manufacturing the illuminated tiles. One would be to do it themselves, at the facilities they have already built on property they own next to their home on Jim Cummings Highway. They say that is their perferred option at this time, one reason being doing so would allow them to hire local workers which would benefit the county's economy. Another option at some point would be to sell the invention to another company, one which has larger production capacity and marketing resources, Cobb said. For more information, visit http://www.CobbHomeInnovations.com.